I was lucky enough to do the John Muir Trail last summer. My hiking partner and I did it in 17 days, and that 17 days took months of planning. 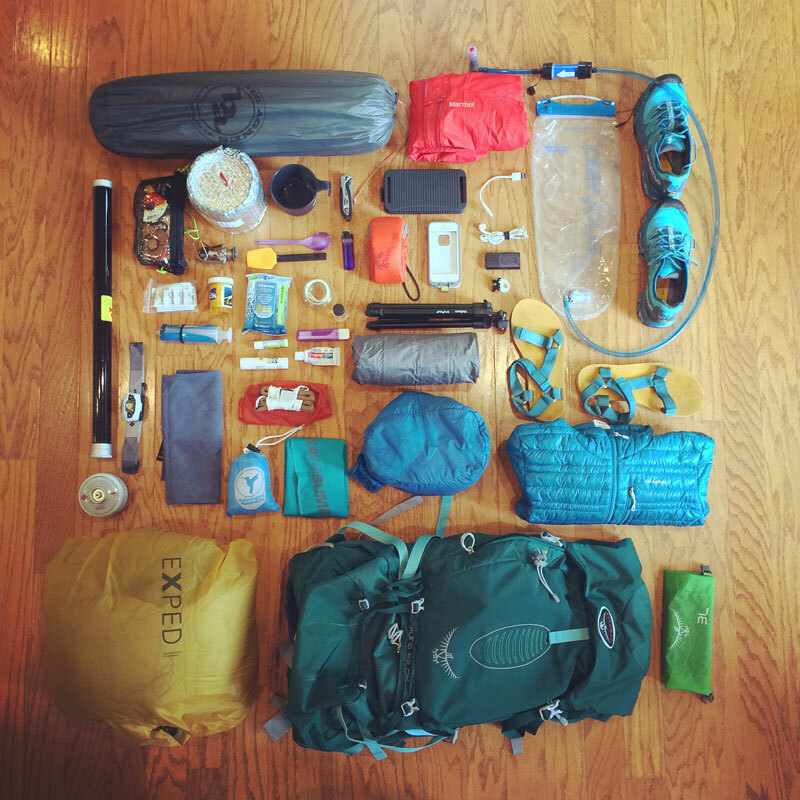 Figuring out what to pack and making a JMT gear list was probably the hardest parts of planning. How many layers? Which tent? How warm of a sleeping bag? Soooo many questions to think about. Oh and the food planning. That’s a whole different discussion. Back to gear, the gear was challenging. I should probably preface this list with the fact that I always try and go as light as possible, BUT I don’t really sacrifice comfort for weight. And I mean come on, I also could not do the JMT with out my camera equipment, which leads to solar panels and cords, and fishing gear. So needless to say I don’t think I was the lightest by any stretch of the imagination, however, I do think that for what I was carrying I was pretty light. In the end I think we nailed it and my JMT kit ultimately became the inspiration for our Backpacking Kit. I never felt like I was missing anything, and I used all the things in my kit that I thought I might not use. There were a couple things I was SUPER glad to have and some things I would have tweeked. I brought a tenkara kit, which was awesome to have. We got into camp before 4 every day and it was so much fun to watch the sunset as we caught some fish. Remember barbless hooks only! We brought a first aid kit and modified it by adding duct tape and a bunch of blister gels. I know this is ridiculous and dumb of me, but this was the first trip I had ever carried a first aid kit on, so I was apprehensive to carry the extra weight… but we used EVERY single item in that first aid kit. Awesome investment, so glad we had it. It’s only 4 oz, and now I take it with me on every trip. My PowerTraveler Solar panel. I had reservations about bringing a solar panel, but since I decided to bring my camera gear I had to bring a solar panel. I would take timelapses of the stars at night so I would wake up to a completely empty battery. One day in the sun would fully charge an empty camera battery and part of my iphone. It worked amazingly well and it seemed like everyone on the trail was having issues with their solar panel. I would HIGHLY recommend the one I carried. My Sleeping Pad. Let me preface with I LOOVE my sleeping pad it is one of my favorite pieces of gear. Comfort wasn’t the issue. Right before we left on the trip I got nervous that my sleeping pad/bag combo wasn’t going to be warm enough since it was snowing in the Sierra in the middle of the summer. I made a last minute decision to swap out my Exped SynMat (R3) sleeping pad for the warmer version of the same pad, an Exped DownMat UL (R6). I sleep hot as it is, so that was the wrong decision for me. I woke up probably 14 of the 17 nights, sweating. It was never that cold on our trip and the warmer pad was overkill. If you’re a cold sleeper then you could maybe justify it, however the temperature never dropped below 40 the whole time we were on the trail.